For printing at work or at home, it's hard to beat the HP 843C for quality and reliability. In the long run your HP 843C will gobble up all of your printer ink, and when that does happen you'll learn that ordering HP 843C ink is normally very expensive. Thankfully, however, you don't have to waste time worrying about dishing out the high prices you'll uncover on the high street because here at Cartridge Save you can pick up all the HP 843 C cartridges you will want at super low prices. Save more cash on your ink by purchasing online with Cartridge Save! Why spend so much on the 843-C original cartridge or 843C compatible ink in the high street when you can quickly save cash ordering with Cartridge Save. You get one hundred per cent confidence when purchasing DeskJet 843C ink cartridges from us as they all are underwritten by a cast iron money back guarantee. Bear in mind that each order has free delivery, usually arriving on the next working day! Built for photo and document printing needs, the HP Deskjet 843C colour inkjet printer promises speed and vibrant colours to help users accomplish creative projects at home or for school. However, actual performance reveals slow print speeds from the Deskjet 843C and a system that is prone to errors and paper jams. The HP Deskjet 843C looks like a plain, plastic printer with its simple 7.3-inch tall, 14-inch deep, and 17.6-inch wide exterior that has minimal controls. 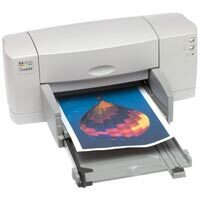 However, it is integrated with a 2MB RAM for photo-quality printing and satisfactory speeds. The HP Deskjet 843C prints with PhotoREt II technology in an attempt to produce realistic colours. The 843C HP printer connects to a PC via USB or parallel connection, and paper is loaded into a curved media path, which is typical of most HP printers. The HP Deskjet 843C inkjet printer produces top quality documents; the text looks clean, sharp, and very legible without obvious fading around the characters. The HP 843C colour printer can handle various types of media. Print quality remains consistent because of the intelligent colour layering technology. Users also like the compact size of the Deskjet 843C printer, which can fit into most desktop spaces. The design itself is a major flaw; the paper tray often causes paper jams. The HP Deskjet 843C is quite heavy, weighing almost 5.5kg, and does not offer postscript support. It can only print at a maximum resolution of 600x600dpi, so don't expect lab-quality photographs. The speeds of the HP Deskjet 843C printer are also slow – a maximum of 8ppm in colour and 0.5ppm in draft mode.